We all the know the importance of having a great and easily accessible website to help your business reach more customers online. But, have you thought about having a locally optimized website? People often think locally optimized websites (also known as microsites) are unnecessary or that they conflict with their business's main website. But, it's actually the opposite. At RevLocal, we offer our clients the opportunity to have their own locally optimized website, called a RevSite, to work alongside their website. Our RevSites are built to put your business ahead of the competition and be chosen by more customers. 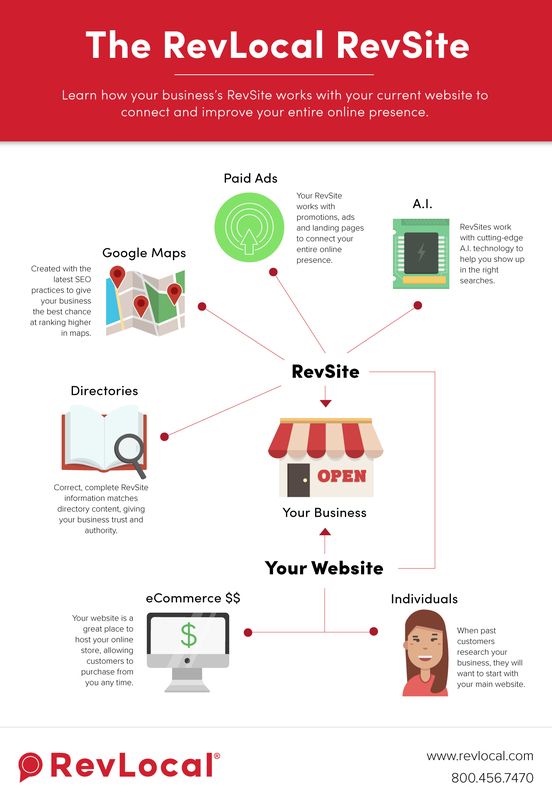 Download our free infographic, or check out our four reasons that RevSites can work for your business below! 1. RevSites work with Google Maps. With a RevSite, we'll put your business on the digital map by using the latest SEO strategies so that more customers can find your store when looking you up on Google Maps. 2. RevSites work with A.I. As new trends in technology emerge, our team of RevSite specialists will stay on top of any changes, using A.I. technology to make sure you're still found in the right searches. 3. RevSites work with online directories. Your RevSite will stay consistently accurate and match all directory content, giving your business the trust needed by search engines to put you at the top of search results. 4. RevSites work with your paid ads. Do you have a sale or store promotion coming up? Our RevSites will work with your paid ads to make sure you're seen by the right customers at the right time.